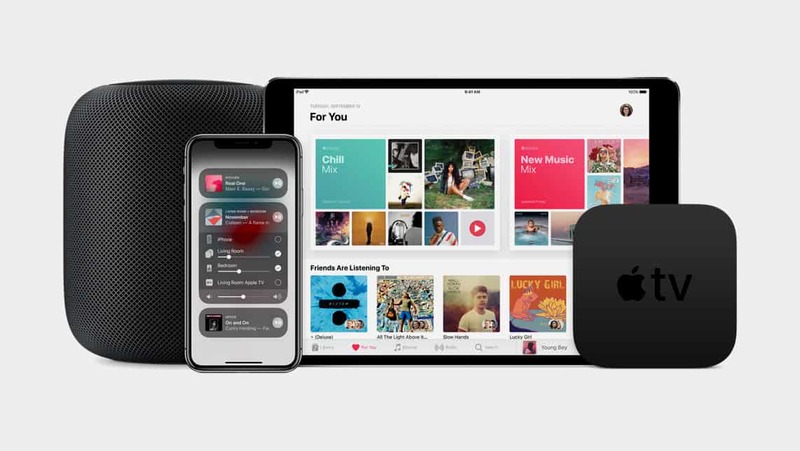 The sound at home is about to get sweeter with iOS 11.4.
iOS 11.4 is finally here, bringing AirPlay 2’s multi-room audio capabilities as well as the long-awaited ability to use two HomePods in stereo. The free update uses AirPlay 2 to move music from room to room or play the same music throughout the home on compatible speaker systems. You can control music using an iOS device, HomePod, Apple TV or making requests through Siri. Apple unveiled the HomePod last year but only began selling its smart speaker recently. Many saw it as late to a space currently dominated by the Amazon Echo and Google Home. HomePod costs more than most other smart speakers and lacks features due to Siri’s limited skill set. Apple, however, seems more focused on delivering — at least for now — a better home music experience. The tech company touts the HomePod woofer as delivering “deep, clean bass.” Plus, seven beam-forming tweeters deliver clear high frequencies and offer greater directional control. AirPlay 2 features are automatically supported in HomePod. Music can be streamed around the house without the need to manually group speakers. AirPlay 2 controls are available on iOS within audio apps and in Control Center for quick access. The speaker, which stands around 7 inches tall, retails for $349. In the upper left corner, tap the arrow icon. In the iOS 11.4 press release on its website, Apple also said the HomePod will arrive in Canada, France and Germany by June 18. The speaker is currently available in the United States, United Kingdom and Australia.